As if last September’s sold-out, high-energy concert by longtime Jethro Tull guitarist Martin Barre and his new, young three-man band at The Strand Theater in Hudson Falls wasn’t enough — Mr. Barre returns this week to the Strand, not only to play but to rehearse and then launch his blow-out U.S. tour marking the 50th anniversary of English prog-rock band Jethro Tull’s United States debut in September 1969. 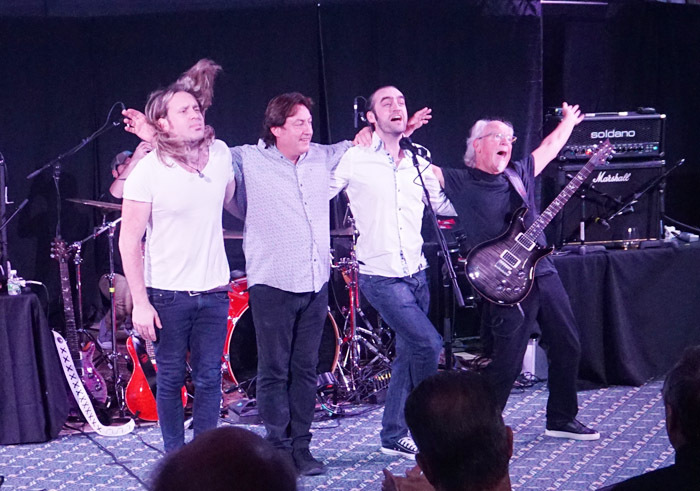 This new tour includes two key former Jethro Tull bandmates — Dee (formerly David) Palmer on the keyboards, and Clive Bunker on drums — alongside Mr. Barre’s already crackerjack current band of Dan Crisp on lead vocals, Alan Thomson on bass, Darby Todd on drums — plus guests Becca Langsford and Ali Hart on backup vocals. ‘Hudson Falls is going to be descended upon,’ Mr. Barre warned The Chronicle last Saturday during a brief phone interview from England…“descended upon by every freighting agency in the U.S.” — for all the equipment and pyrotechnics coming our way, Mr. Barre jokes. See the picture above to get a sense of how enthusiastic Mr. Barre was at the close of his first concert at The Strand last fall. After the show, he and his band hung out for hours at Maxwell’s Pub next door, talking to Strand director Jonathan Newell and core Strand crew members. Was Mr. Barre’s experience here as enthralling as it seemed at the time? Something struck, enough that he planned to make himself at home here for a week before the concert tour, to work out the kinks and bring the band and special effects together. 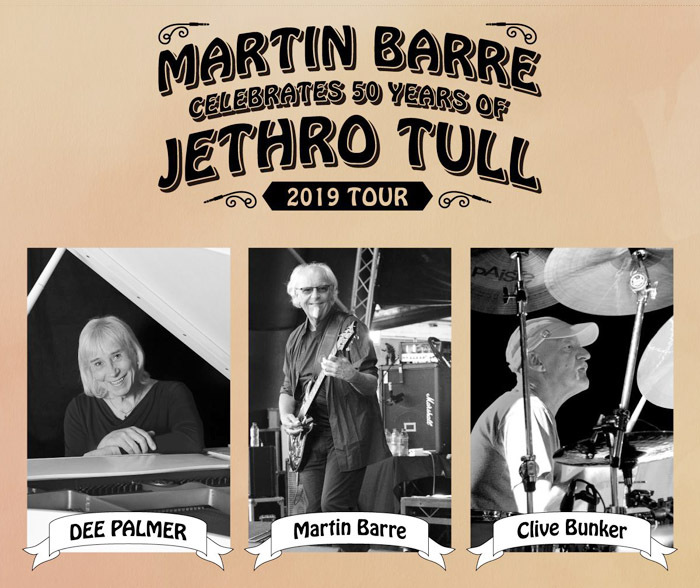 Typically, Jethro Tull music is an important part of any Martin Barre tour, he said, but Mr. Barre has long made his own way on solo recordings and original music as well. This observer went in excited for “Jethro Tull,” and left the September concert a fan of Martin Barre, for both his virtuosity, his generosity and humor on stage. Going back to the Jethro Tull exclusively, learning it with his own band and the integrated former bandmates has been “very interesting,” Mr. Barre, 72, says. Three ‘Tull’ originals — Dee Palmer, Mr. Barre and Clive Bunker. “Dee and Clive are new to big tours,” he said, “so we are being very slow and sure about our routine. They are very, very excited. They were a big part of the history. How has his experience of the music scene changed in 50 years? Mr. Barre says, “In 1969, we had a very basic routine. Gigs were very run down and nobody could predict the outcome. Lots of drugs and lots of bad music, but loads of venues and keen fans. The PA’s and back line gear was very unreliable. He says, “the most vital Tull line up was around the Bursting Out tour. We had a great line up with a very established show. Note that iconic frontman Ian Anderson is on his own separate Jethro Tull 50th anniversary tour, with his own band. 50 Years of Jethro Tull plays The Strand Theatre on Main Street, downtown Hudson Falls, Friday and Saturday, April 12 and 13, at 8 p.m. Tix: “$50 for 50 years,” they say, general admission. Box office: 832-3484, or online at Brown Paper Tickets.